LISBON — José Saramago — who became the first Portuguese-language recipient of the Nobel prize for literature although his popularity at home was dampened by his unflinching support for communism, blunt manner, and sometimes difficult prose style — died yesterday at the age of 87. Mr. Saramago died at his home in Lanzarote, one of Spain’s Canary Islands, of multi-organ failure after a long illness, the José Saramago Foundation said. “The writer died in the company of his family, saying goodbye in a serene and placid way,’’ the foundation said. Mr. Saramago was an outspoken man who antagonized many. He moved to the Canary Islands after a public spat in 1992 with the Portuguese government, which he accused of censorship. His 1998 Nobel Prize was nonetheless widely cheered in his homeland after decades in which the award eluded writers of a language used by some 170 million people around the world. “People used to say about me, ‘He’s good but he’s a communist.’ Now they say, ‘He’s a communist but he’s good,’ ’’ he said in a 1998 interview. Born in the town of Azinhaga near Lisbon, Mr. Saramago was raised in the capital. From a poor family, he never finished university but continued to study part time while supporting himself as a metalworker. His first novel, published in 1947 — “Terra do Pecado,’’ or “Country of Sin’’ — was a tale of peasants in moral crisis. It sold poorly but won Mr. Saramago enough recognition to allow him to jump from the welder’s shop to a job on a literary magazine. But for the next 18 years Mr. Saramago published only a few travel and poetry books while he worked as a journalist. “I suppose I came to the conclusion I had nothing worth telling,’’ he said of that period. He returned to fiction only after the four-decade dictatorship created by Antonio Salazar was toppled by a military uprising in 1974. The story is set during the Inquisition and explores the battle between individuals and organized religion, picking up Mr. Saramago’s recurring theme of the loner struggling against authority. 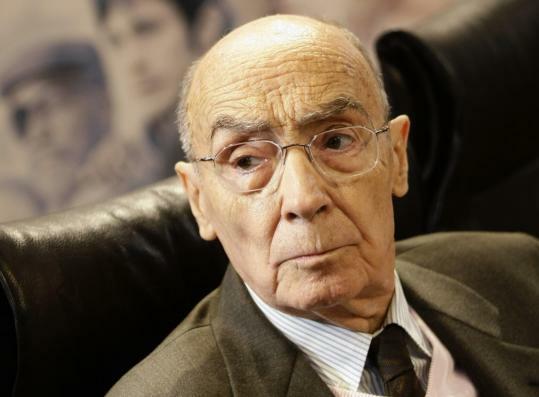 That kind of conflict surfaced in the heated clash Mr. Saramago had in 1992 with Portugal’s undersecretary of state for culture, Antonio Sousa Lara. The incident prompted Mr. Saramago’s move to the Spanish islands off northwest Africa. Sousa Lara withdrew the writer’s name from Portugal’s nominees for the European Literature Prize. Lara said Mr. Saramago’s 1991 novel, “O Evangelho Segundo Jesus Cristo’’ (“The Gospel according to Jesus Christ’’), in which Christ lives with Mary Magdalene and tries to back out of his crucifixion, offended Portuguese religious convictions and divided the heavily Roman Catholic country. Mr. Saramago was outraged and accused the government of censorship. From the 1980s, Mr. Saramago was one of Portugal’s best-selling contemporary writers and his works have been translated into more than 20 languages. But he never courted the kind of fame offered by literary prizes and his bluntness could sometimes offend. “I am skeptical, reserved, I don’t gush, I don’t go around smiling, hugging people, and trying to make friends,’’ he once said. His outspokenness set off a storm of protest in 2002 when during a visit he compared Ramallah, a Palestinian city blockaded at the time by the Israeli army, to the Nazi death camps at Auschwitz and Buchenwald. Holocaust survivors and intellectuals, including left-wing doves who were highly critical of the Israeli government’s policy toward the Palestinians, condemned Mr. Saramago’s statement as false and anti-Semitic. In 1998 he said his book “Blindness’’ was about “a blindness of rationality.’’ In that book, which was made into a 2008 movie starring Mark Ruffalo and Julianne Moore, the population of an unnamed city is struck by a mysterious blindness that is never explained. Society’s fragilities come to the fore as a general breakdown of infrastructures ensues. Such compassion and anxiety about the skewing of priorities in modern society is evident in all his works and also gives a clue to his enduring sympathy toward the Communist Party. He was frequently compared with Colombian writer Gabriel Garcia Marquez, and his writing is often described as realism tinged with Latin-American mysticism, particularly for his technique of confronting historical personages with fictional characters. Others disagreed, saying that Mr. Saramago was too intellectual and that his storytelling pace often slowed to a dreary plod or that his sparing use of punctuation and speech marks confused the reader. Historical and literary mischief were Mr. Saramago’s trademarks. In “The History of the Siege of Lisbon,’’ from 1989, a Lisbon proofreader mischievously inserts the word not into a text on the 12th-century capture of the Portuguese capital from the Moors, thereby fictionally altering the course of European history with a stroke of his pen. In his 1986 book, “The Stone Raft,’’ the Iberian peninsula snaps off from the rest of the European continent and floats off into the North Atlantic, apparently in a metaphorical search for identity away from the standardizing nature of the EU. Mr. Saramago leaves a wife, Spanish journalist Pilar del Rio, and a daughter from his first marriage.